It’s been one to get stuck into over the break – it’s the first project that has the ribbing to the bottom to create the rim (alternating knit & purl stitches). It almost went massively wrong when I’d started decreasing too soon to make the crown, which would have ended up with the hat coming to about halfway down my forehead (thankfully, Mum was on-hand to help with putting it all back on the needles). So, all that remains is to add a few more rows to get it further down my head, then decrease stitches at the right point so it doesn’t look silly. Head shots with it on when it’s worth seeing. 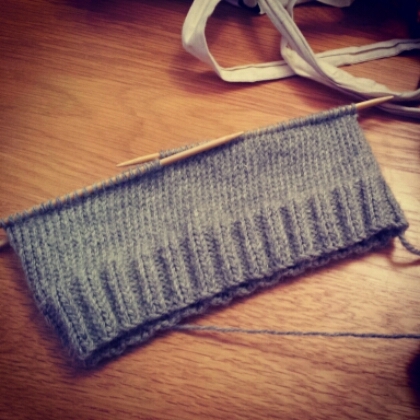 Achievement Unlocked: Gentle Ribbing – Basic ribbing added to a piece of work. This entry was posted in fun, geek, making, Project E, projects and tagged knitting, projects, update. Bookmark the permalink. Who doesn’t enjoy a good ribbing every now and again?